Marisa Repasch is a PhD student in the International Research Training Group "StRATEGy" and a member of the geomorphology section at GFZ-Potsdam. She holds a M.Sc. degree in Earth and Planetary Sciences from the University of New Mexico. Her primary research goal is to understand how rivers transport, store, and distribute organic carbon in the landscape. 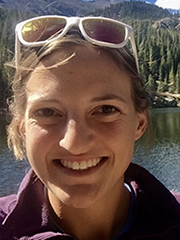 She combines stable isotope chemistry of leaf wax biomarkers with cosmogenic nuclide analyses and grain-scale studies to better understand these natural fluvial processes.